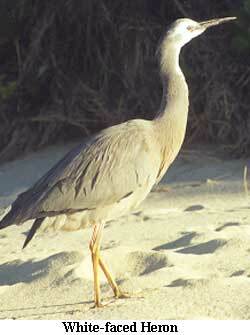 Long Reef originally consisted of a heath and wetland vegetation community. 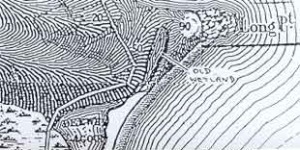 The location of the original wetland is shown clearly on the contour map on the left. Drawn in the late 1860s, it shows the wetland actually drained into Dee Why lagoon near where the Long Reef Surf club now stands. The Dee Why lagoon flowed into the sea south where the Dee Why Surf Club now stands. In the 1920’s the grassy headland and original swamp were leased to the Long Reef Golf Club to be reclaimed as a golf course. 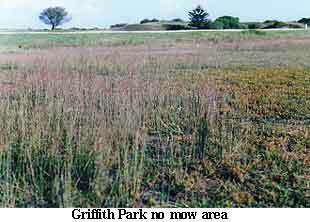 Only a narrow perimeter of remnant vegetation remained around the headland. “A swamp with grassy surrounds, reed and rush-lined margins. In the honeysuckle trees (Banksias) surrounding the swamp hundreds of honeyeaters, New Holland, Yellow-tufted, White-eared and others chattered and squabbled. All the birds were remarkably tame owing no doubt to the fact that they are not molested over much, except at weekends when campers generally include (the) rifle or gun in their equipment and in a Sportsmanlike (way) creep through the bushes and shoot the Blue cranes that come to roost for the night amongst the trees. It is only a matter of weeks now when Narrabeen Tram will be running and Dee Why will be made more accessible to Campers and picnickers”. Published in The Sydney Mail, July 3 1912. 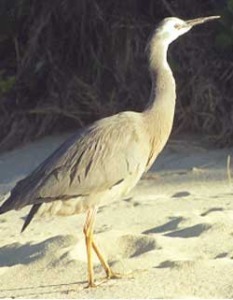 We assume the Blue cranes are White–faced Herons – their modern name (left). A few Banksia trees still grow in the park – all that remain of the once “forest of trees” under which visitors camped in the 1930’s. In the 1940’s during the second World War all trees were removed by the Australian Army to improve vision across Long Reef in fear of Japanese invasion. From here in Griffith Park the “Greenlink Walk” passes through a She-oak woodland, around through the hind dunes behind Long Reef beach and up to the headland – the original “Nature Walk” which existed when Mr Maclean took his walk in 1912 around Long Reef. 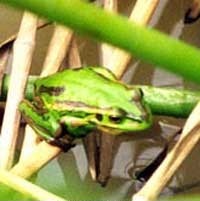 Long Reef’s newly restored wetland is attracting native frogs. This small pond – a natural spring fed by rain water from the Collaroy Plateau – was infested with weeds, Coral trees and garden waste. Volunteers working on the new Greenlink Walk project have cleared the area and replanted it with locally propagated wetland plants. 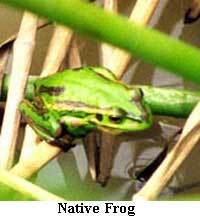 Since the first rains in March 2003 native frogs (right) have taken up residence. 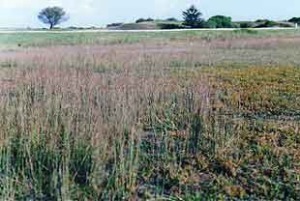 This wetland can be seen in Griffith Park.